Publicly, KPMG and Ernst & Young are currently focused on limited offerings grounded in due diligence and social media governance. Ernst makes broad mentions of “strategy” and roadmaps. Big Four firms have some of the strongest core competencies in business strategy, business transformation, and operational advice of the advisory firms studied. They also show a very low level of social business practice, so they rank highest in the early part of the Social Business Life Cycle. That said, their broad core competencies could enable them to address the entire cycle if they amped up their practice of social business. All firms studied have focused on producing social business-oriented thought leadership, and those with “social”-oriented services have housed them in marketing, brand or customer practices. Deloitte features thought leadership that explicitly addresses business transformation, which shows that they understand the the opportunity. PwC and Ernst & Young address it more peripherally. Feasibility assesses the adoption of social technologies by a client’s stakeholders as well as certain aspects of the client organization, so it emphasizes the market as much as the client’s readiness to implement social business. Deloitte and Ernst & Young described Feasibility-oriented services, but information was general and not compelling, although it was business transformation-oriented. No firm showed that they understood the importance of engaging specific stakeholders to increase trust and business. This is within grasp of their competencies, and some firms’ actions imply that they are defining their services now. Their firm category has a Medium-High capability. Strategy focuses on identifying the optimal social venues in which to engage, determining the client’s highest impact assets and designing pilots to execute the strategy. Firms conduct granular analysis of social venues, stakeholders’ social actions and client assets and business processes. A valuable social business strategy requires strong knowledge of social business practice, and Big Four firms exhibit low levels of social business practice. They have a Medium capability because their focus is organizational change and they claim to address the life cycle. Pilot involves guiding clients’ execution of social business strategy, and Big Four firms have a little demonstrable experience in social business practice. No Big Four partners were found interacting publicly in meaningful ways. Thus they are slated None. Scale focuses on forging mature social business programs by expanding Pilot; however, its requirements for expertise are even higher since the effort is more mature and the investment higher. In theory, Scale is well within Big Four core competencies, but since they are missing social business practice, they rank None. Integrate evaluates mature business processes in light of social business and integrates them or replaces the mature process with a social business process. The competency required is shared between social business and legacy, so Big Four core skills are more relevant. This is definitely within their core competencies, but their low level of social business practice flags them None-Low. Big Four firms’ highest Overall scores cover a wide spectrum, with Deloitte significantly in the lead and Ernst & Young in the middle. PwC and KPMG trail significantly. Deloitte has the most coherent thought leadership. However, its main blog has merely three posts categorized “social media” (no social business), and the latest post is dated 2011. This is indicative of all Big Four firms; unlike Marketing/Advertising/PR and Analyst firms, which use social technologies and have begun to change their behavior, Big Four firms are way behind on the learning curve. Strategy firms show significantly better than Big Four. Pureplays and Enterprise I.T. reports will show their prowess. Since Big Four partners and Directors are largely absent online, firms’ credibility is questionable. Acquisitions are one solution; however firms’ staid partnership structures can be stifling for acquired firms, so they need to manage “integrations” appropriately. Partners’ reticence lowers firms’ Practice scores and prevents them from engaging the market. Becoming competent with interacting and building relationships in public requires mastery of implicit knowledge that’s learned by doing. 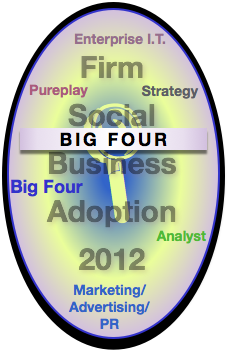 Big Four score well in Leadership because they are large and adept at relevant research, thought leadership and tools. Like Analysts, they are widely quoted trusted sources of market analysis. However, their efforts here won’t position them as significant players unless their partners walk the walk. Deloitte’s Practice definition mentions services in social business strategy, enterprise collaboration (software, systems), social media & commerce, social monitoring and governance. Although few specifics are given, they clearly show their intention to address several parts of the life cycle. However, the lack of firm leadership blog posts about any of these topics significantly questions their depth of competency. Nonetheless, they had the top Overall score of the Big Four. Ernst & Young has a predictable approach, a pdf position paper/brochure that explains social media strategy, policy and governance. It shows that the firm has some understanding, but it specifies no services. Likewise, it offers minimal thought leadership or blogs accessible from its main domain. PwC announced the acquisition of Ant’s Eye View in August 2012, but they have diminished the immediate value the acquisition could bring to new clients by neglecting their website (disclosure, I’m an alum). The firm has no social business competency in evidence outside of Ant’s Eye View, and the latter’s domain now points to the PwC Customer Insight practice, which has nothing relevant to social business except a news release. Outside of the research survey, I found Ant’s Eye View information on LinkedIn, but it doesn’t count according to the use case. On pwc.com, the bios of six Ant’s Eye View executives help somewhat, but they do not address the Social Business Life Cycle. The firm offers no description of its services, no blogs and no point of view. PwC’s score would increase significantly were the firm to make its new competencies more transparent. I expect the relaunch of a combined practice in 2013. KPMG has taken a similar approach to Ernst & Young, with a different twist (disclosure, I’m an alum). It has no point of view or Practice definition on social business, and several of its mentions relate to social media and sourcing. KPMG bought EquaTerra in 2011 to position itself as a multisourcing leader. Its domain yielded nine posts tagged “social media,” but none substantially address business transformation or the Social Business Life Cycle. Like Ernst, KPMG mentions governance and controls, not opportunity. As reflected by analysis under Capabilities and Score Distribution, Big Four firms have a nascent capability in social business. Deloitte has put the most concerted effort into addressing social business transformation, but PwC shows that it intends to grow into transformation-oriented social business. Ernst & Young and KPMG are question marks for now. Here is my guidance for considering a Big Four firm partner for social business initiatives that emphasize organization transformation. Big Four firms have numerous core competencies that can be relevant, but their readiness as organizations is doubtful. That said, as with all advisory firms, individuals often matter more than firms, so evaluate their proposed team, and validate their competency publicly. Numerous members of the proposed team should be able to share links to open interactions on meaningful topics that are relevant to work you want to do. If not, keep looking. Firms’ published Point of view, Practice definition and thought leadership are important signals of firm organizational commitment. The Big Four can potentially address the entire Social Business Life Cycle once they raise their competencies in social business execution. Deloitte and PwC are talking about it in the right way. Notably, they are significantly ahead of Marketing/Advertising/PR firms which have the task of reorienting themselves away from social media. Big Four firms’ egregious weakness is social business practice. Although social business uses digital tools for social transactions, sociality is the key; the technologies just provide mechanical tools to communicate and share being human. Therefore, humanness is the differentiator. Sociality is difficult for professional services until they come to grips with it and change their orientation; as a 25 year veteran of professional services who hails from a medical family, I have had to go through that journey and appreciate how difficult it is. “Professional” connotes expertise, not “personality.” They do not have to be mutually exclusive, but most professionals will have to go through a period of synthesis to rebalance and learn how to be expert, conservative and human. The Big Four carry the additional cultural impediment of being regulated businesses. Their audit and tax practices are highly scrutinized, they deal with sensitive information, and privacy and discretion are the bedrock of firm cultures. This makes having transparent, spontaneous conversations in public a difficult proposition for the Big Four. Even though social business/media is thus far housed in advisory (erstwhile “consulting”) practices, the culture holds even if the legal/compliance is a bit more arm’s length. Do not pick a “type” of advisory firm; look for a balance of leading edge thought leadership and walking the walk. Big Four firms do not show through their people on their main domains that they are comfortable using social technologies for their core business processes. I predict this will change significantly in the years ahead. Look for opportunities to partner with Big Four firms in social business transformation to help them build their practices through engagements with your company. Most important, own your organization’s journey, don’t abdicate to any advisor. Big Four firms have broad capability in business strategy and transformation, so they could be valuable partners if the team were right for your needs. As Score distribution indicates, think to use Big Four firms during Feasibility and Strategy, where their capabilities resonate strongest with the Social Business Life Cycle. From a firm perspective, Ernst & Young and KPMG reflect an very conservative attitude toward social business, so as partners they may not understand the breadth of your opportunities as well as your risks. This could well hold true for PwC and Deloitte. Unlike Strategy firms, Big Four advisory practices ground more of their competencies in big technology. Deloitte’s emphasis of “enterprise collaboration software” reflects this tendency. Although technology can play an important role, it is not the important thing. The “soft” human skills, modeling how to interact in “digital public” to inspire trust and relationships within a digital social venue, are the differentiator. Beware of Big Four firms’ and Enterprise I.T. firms’ tendencies to bolt on social business to their mature software solutions practices. Core competency in business strategy and business process transformation. Executive relationships in many enterprise functions, including marketing and communications. Some market permission for transformation work. Some firms have large, sophisticated process transformation and training practices, project management offices, centers of excellence, etc. Advisory practices have strong links to enterprise technology vendors, and they can be relatively entrepreneurial about building new competencies. Relatively low awareness of people and sociality. Conservative cultures that emphasize privacy; many professionals uncomfortable with being public. All but Deloitte jettisoned advisory (then “management consulting”) in the 2000s, so their current rebuild will likely differ; currently they are very conservative, which may prevent them from moving quickly. Practices and team vary; some are ultra-conservative, but others are more freewheeling and open to change, so look for the team, not only the firm. They could be exceptional contenders were they to start hiring sociology and anthropology graduates; to work, they would have to commit to significant culture change (from formal and structured to free-flowing and spontaneous). Partnerships with MAP agencies might work if well diligenced and their visions and competencies resonated. Each has what the other lacks: agencies have the best social knowledge of any firm category, and Big Four are strong in business process and solid in business strategy. Conservative cultures and lack of background in sociality may prevent them from moving quickly enough to position themselves as leading contenders. Social technologies are fast-moving and highly visible, so Big Four firms will have to learn to move much more quickly if they want to prove relevance and build practices. Mistakes of disclosure are easy to make and could threaten their other businesses, which are highly private. Strengths of Big Four firms address most of the Social Business Life Cycle, namely strategy and transformation, so they could become valuable partners in navigating social business-related disruption of organizations. Social technologies will severely disrupt many organizations, and Big Four firms have strong expertise in enterprise functions and industries. They understand technology disruption to organization. Weaknesses are mostly social and a habit of avoiding the spotlight. Insist on seeing a firm prove its social business expertise by showing its team’s interactions online. All advisors learn during client work; just be sure you understand their level of expertise. Big Four firms that want to expand into social business can be congruent if they make this explicit. CSRA, for example, has a Beta Program for new offerings. We disclose to clients why we think we can add value, but we share that it’s a new area, and we charge them a special Beta Program rate. Opportunities will increase for Big Four firms that approach their cultural and structural challenges head on. Social technologies accelerate market volatility and change, as described in the Social Channel. Firms’ analytical capabilities are becoming more relevant, especially for Big Four firms that develop real skills in sociality, which will usurp value from legacy determinants of competitive advantage. However, sociality is far more complex and nuanced. Like Strategy firms, Big Four firms can innovate by partnering with clients to develop metrics for sociality. The metrics used in this Research Survey can serve as an example. Big Four firms’ strong quantitative skills and methods could enable them to innovate extensively with social data. Threats are largely grounded in Big Four firms’ private natures, which could maintain enough resistance to prevent the firms from moving quickly enough to remain relevant. Social technologies are emergent, fast and spontaneous. They imply loss of “control” in many contexts. Social business will disrupt clients’ businesses, and if Big Four firms aren’t in the social business trenches, their understanding will be limited, and they will lose relevance. Lastly, firms with active social business practices would have to take care to disclose information that might reflect badly on audit and tax businesses. ?Social business will transform society and business because it changes the economics of relationships, what people do and how they do it. Moreover, people are leading the change, not organizations. Generally, disruption increases demand for their services. That said, the kind of change that makes a difference is changing from mechanical to personal. Like Strategy firms, Big Four can use their own culture transformation to subsequently advise clients. Don’t approach this transformation superficially as some stakeholders will prefer. Most firms are “going through the motions,” and very few partners interact with social technologies. Senior partners have to be involved to make it real. Consultants epitomize “knowledge workers,” and social business consultants have individual reputations that may dwarf organizations. You will be better able to engage stars if your firm redefines itself as a platform for individual consultants to develop their careers. Optimize your roles to empower individuals. This requires jettisoning paternalistic attitudes that pervade Big Four, Strategy firms, MAP agencies and Analyst firms. It is difficult to overstate the profound change that is upon individuals and organizations. We primates are profoundly social; sociality is arguably our defining trait. Making sociality digital will change most human structures, organizations, patterns and habits. To remain relevant, Big Four firms need to be in the middle of it—as practitioners. Advisory firms that fail to develop strong social skills will lose relevance because sociality will disrupt clients, who will seek advisors who are truly expert in sociality for business, so developing social business practices is defensive as well as offensive. Therefore, social business capability can enable Big Four firms to mitigate the risks in how their existing businesses weather the storm. Clients’ needs will change profoundly, and seeing their evolution from the inside will be a significant advantage. Careful management can maintain existing profit margins for years to come, especially when Big Four firms focus on how social business is affecting legacy practices. Not starting the firm culture change early enough. 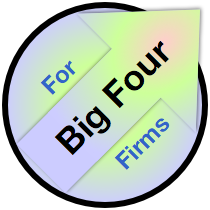 The Knowledge Economy is a more personal and public economy, and Big Four firms tend to be formal and very private. Obviously there is a spectrum, and firms will always have distinct cultures. Overall, though, firms will have to loosen up. Client expectations are rising quickly. Big Four firms that delay adoption too long will never become relevant; this market, because digital interactions move so quickly, develops faster than anything humankind has experienced before. Failing to appreciate that social business is vastly different from Web 1.0, “the Internet.” It is social, which is the engine of everything people and society do. It will require much more social awareness, which is outside Big Four firms’ traditional competencies. However, neither do Strategy, Enterprise I.T. or Analyst firms show their understanding of sociality. MAP agencies understand people much better than any other firm type, but they are unaccustomed to relating to people. They sell to them. This creates a vacuum in the market that any firm can address.